"The good news is that an exogenous static NEGATIVE MAGNETIC FIELD of sufficient gauss strength and sufficient duration supports the human biology's NATURAL NEGATIVE MAGNETIC FIELD, effectively and non-toxically, KILLING CANCER." All information is for educational use only and is not to be construed as medical advice. Written by William H. Philpott, M.D. Below are scientifically proven and documented facts about this therapy. Cancer can not exist in a continuously applied strong negative magnetic field. "The positive magnetic field encourages cancer growth. The negative magnetic field inhibits cancer growth." "The biological response to a static positive magnetic field is acid-hypoxia. The biological response to a negative magnetic field in alkaline-hyperoxia. Cancer implanted on the skin dies in response to a static negative magnetic field." In 1982, Robert O. Becker and G. Sheldon documented that a static positive magnetic field is a signal of stress and a negative magnetic field is present during healing. In 1996, Raymond Raylman documented that a strong, prolonged magnetic field killed cancer. 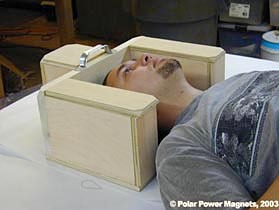 Arthur Trappier, in 1990, documented that it is the negative magnetic field that kills cancer. IT IS AN ESTABLISHED FACT THAT A PROLONGED SUSTAINED STATIC MAGNETIC FIELD PRODUCES CANCER CELL REMISSION. Magnetic therapy of cancer replaces the acid-hypoxia-dependent transferaseenzyme catalysis (fermentation) producing ATP with alkaline-hyperoxia oxidoreductase enzyme catalysis (oxidation reduction) of producing ATP. Cancer cells are thus robbed of their ability to produce ATP by fermentation. Cancer cells die because they can not produce ATP in an alkaline-hyperoxia medium. Acid-hypoxia is the central casual factor in degenerative diseases in general and cancer development in particular. The initiating causes of of acid-hypoxia are many, such as, toxic reactions, physical injury, local or systemic stress, prolonged emotional stress, nutritional deficiencies and so forth. Cancer cells die in the presence of a continuous static negative magnetic field. Both "peer reviewed" and non-peer reviewed publications confirm the death of cancer cells from a static negative magnetic field of sufficient gauss strength and sufficient prolonged duration. A static magnetic field is the breat of life for human cells and the kiss of death for invading microrganisms and cancer cells. Definative negative magnetic field therapy for the treatment of cancer is justified and recommended by both peer reviewed and non-peer reviewed evidence.